Eight volumes of the first edition of George Eliot's 'Middlemarch' fetched £15,000 in our Book Sale on the 26th August 2015 (BK14/92). It is not uncommon for important modern books to be serialised in newspapers before wider publication. Political biographies are of especial interest but other books too sometimes appear in this way. Of course, by presenting a work like this, newspapers are hoping to attract more readers, initially because of interest in the subject (anything promising to reveal scandal is always a good bet - are you listening Lord Ashcroft?) and once the reader is hooked then they are sure of buying subsequent editions for the next exciting episode. This, of course, is far from being a new idea: one of the most successful serialisations ever was 'The Pickwick Papers' by Charles Dickens published in 20 monthly parts during 1836 to 1837. These parts were priced at 1 shilling each, which had the effect of ensuring a wider readership due to the modest cost and kept readers hooked for the next issue. Each issue usually had two illustrations and carried adverts. At the end of the run one could if one wished pay to have the whole work bound in a volume and many people did. 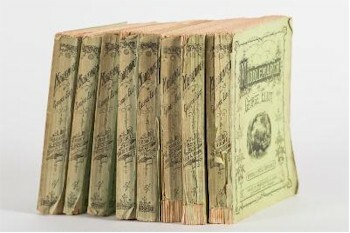 Towards the end of the run, the publisher would produce their own bound copy and these are known as "First editions in Book Form". Nearly all Dickens major works were published in this way and the study of the various different editions of the parts and which part carried particular advertisements and which had particular printing errors is a whole area of study in itself, designed to lead the purist to the very first edition of each part. A set of these is almost invariably the most valuable version of a particular work. Some magazines were dedicated to publishing books in this way - the Strand Magazine is a particularly famous example. Sir Arthur Conan Doyle famously publish Sherlock Holmes short stories in it and when 'The Hound of the Baskervilles' was serialised it led to queues of people outside the publisher's office waiting for the next issue. Other authors who contributed to the Strand Magazine included Agatha Christie, Dorothy L Sayers, Rudyard Kipling and even Winston Churchill. One of the best known works to be published in separate parts is George Eliot's masterpiece 'Middlemarch'. As she wrote the book, it became clear it was too long for the traditional 3-volume format of the time and yet she didn't want it split into 20 parts in the manner of Dickens or Thackeray. The compromise was to publish it in eight two-monthy parts. This was not an entirely new idea as Victor Hugo's 'Les Miserables' had been published in a similar way.